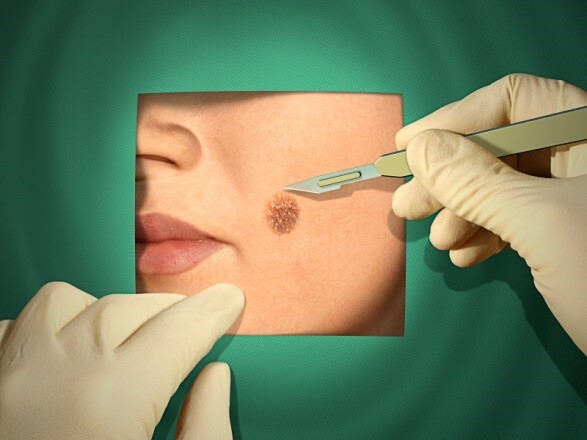 While many skin cancers, particularly in the early stages, can be treated very effectively with treatments other than surgery, such as photodynamic therapy and topical treatments, surgery is often the preferred treatment for many skin cancers. Generally it will provide the highest rate of cure. However, like all procedures, there are risks associated with surgery. Your dermatologist is an expert in helping to determine whether surgery is suitable for a particular type of skin cancer. The greatest likelihood of cure for skin cancer is often obtained through surgery. It should be noted however, that despite surgery in the most capable hands, generally some scarring occurs and risks of infection, pain, bleeding and swelling need to be considered. Complex cases in difficult sites are sometimes referred to a specialist plastic or ophtalmic surgeon or in some cases, to a radiation oncology specialist for treatment with radiation. Your dermatologist can refer you to one of these other specialists if it is considered necessary. One of the benefits of having surgery for skin cancers is that it offers patient convenience. Most skin cancers are treated in a single visit to the dermatologist followed by removal of stitches one to two weeks later. Many surgical procedures for treating skin cancer are covered by Medicare and offer you significant reimbursement to your costs. Your dermatologist may also offer you a surgical procedure where stitches can be avoided. A procedure referred to as curette and cautery is a simple and quick procedure that your dermatologist can perform for treating small and early skin cancers. Often this can be done on the same day as your consultation. Whilst the recovery period is slightly longer, the cure rate and cosmetic outcome are generally of a very high standard. Your dermatologist will recommend this type of treatment for you if they feel it is appropriate.